More Children Caught In The Crossfire Amid Chicago Street Shootings Spike Even residents of neighborhoods accustomed to a rise in gun violence in the summer are particularly alarmed now: Fifteen kids age 12 and younger have been injured by bullets so far this year. 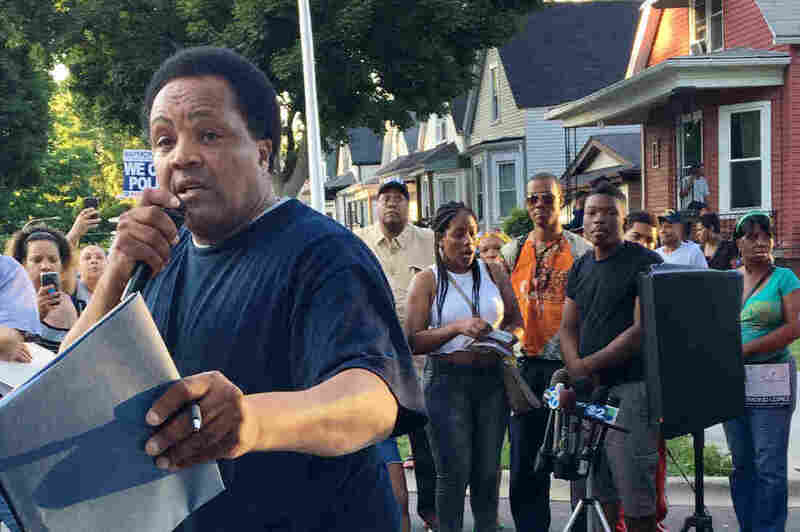 Community activist Aleta Clark speaks to residents and police gathered for an "Operation Wake Up" rally in Chicago. At least 15 children age 12 years old and younger have been injured by gunfire since the beginning of the year. Tacarra Morgan lives in a big two-story, A-frame house that sits next to an empty, grassy corner lot on Chicago's South Side. On a sunny afternoon earlier in July, gunfire broke out while the 6-year-old sat on the porch with her grandmother and her mother, Carolyn Morris. "All l I know, bullets starting coming from that way. I didn't see who was shooting," Morris says. "I didn't see anything and my daughter is so strong, I didn't even know she was shot." They all ran in the house; all Tacarra said was that her stomach hurt, her mother recalls. "I raised her shirt," says Morris, "her stomach was gushing out nothing but her intestines." 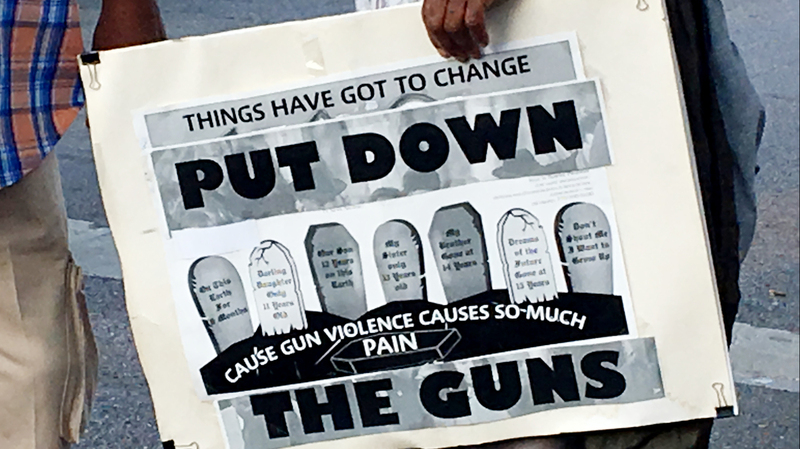 This year, shootings have been on the rise in several cities across the country; at least 370 children in the United States — 12 years old or younger — have been harmed or killed by gunfire so far this year, according to the nonprofit Gun Violence Archive, which collects gun violence data daily. Accidents like kids playing with guns, and domestic disputes, often cause the injury and deaths of young children. But in Chicago this summer, it's a different worry. Although many shell-shocked neighborhoods on the city's South and West sides typically expect an increase during the summer, a spike in street shootings in the city — more than 2,000 so far this year — has alarmed residents and made gun violence even more of a threat for youngsters. Since the beginning of the year, at least 15 children in the city, age 12 and under, have been wounded unintentionally by bullets, says Andrew Holmes, a community activist in Chicago. He rattles off the incidents: They started Feb. 11, when a young child was shot at 3700 West Chicago. Two days later, a 2-year-old was shot at West 64th. The list of incidents in which gunfire harmed young children goes on. The day after Tacarra Morgan was injured, Chicago police set up folding chairs in the intersection not far from the little girl's house, and residents gathered for the "Operation Wake Up" police-and-community rally. On a table, there were brochures and sign-up sheets for anyone interested in organizing block clubs or mentoring. At least 15 youngsters, aged 12 and under, have been hit by gunfire in Chicago. Residents and police are holding community rallies urging residents to sign up to take action from forming block clubs to mentoring young people. Police coordinator Glenn Brooks, microphone in hand, spoke first. "What is the most important thing to do today?" he asked. Those who gathered for the meeting shouted in approval as Brooks said the answer was to sign up and get organized. "If we don't get organized," said Brooks, "there is another child that will get shot." Raymond Lopez, a Chicago alderman, echoed the plea for residents to get involved. "When I came here the other day, 44 bullets laid on this street," Lopez said. "This is an atrocity that is repeated daily in our communities and it has to stop." Aleta Clark, a 26-year-old community activist, agreed. 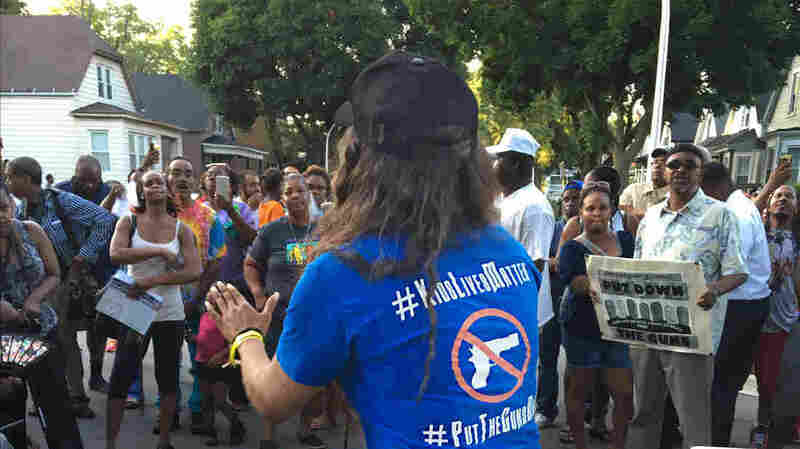 Wearing a T-shirt with the slogan "Hugs not slugs," Clark brought her two children and several other kids from the neighborhood to make them aware of what they're up against. Clark said she wants them to see things outside their comfort zone — to see that bad things are happening to kids like them. "That's why I work so hard to keep them safe, to keep them happy," she said. "So this type of thing don't happen to them." Clark also voiced her frustration at what she considers a code of silence over the shootings that occur in the neighborhood. "If it was a cop that did it, this whole neighborhood would be a bunch of angry African-Americans." She then asked the crowd, "When are we gonna start holding our own people accountable?" Another parent, Keith Kysel, said he has had the hard conversation with his 7-year-old daughter, Harmony. "I have to tell her sometimes at the park, 'It's time to go,' because we see certain people in the park that might become targets, and we don't want to be in the way," he said, then telling his daughter, "We just have to be careful." Harmony, however, just wants to be a kid. "I should be able to go outside and ride my bike to the park and do activities," she said. "Not be scared and go back into the house because somebody is doing something bad." Keith Kysel said he and other parents are just trying to prevent what they hope is not becoming a "new normal" for young children in their neighborhood.